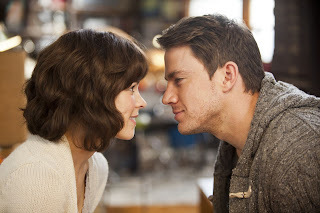 A sincere romance, The Vow fulfils its objective but never risks much excitement. The story of crash-induced amnesia threatening an ideal marriage is inspired by real events and told with heart, but there is no zing to energize the purposeful march towards a predictable resolution. In Chicago, Paige (Rachel McAdams) and Leo (Channing Tatum) meet, fall in love, and get married. She's an artist and he owns a music studio, and together they are the definition of a perfect couple. Their lives are shattered when Paige is knocked unconscious in a car crash. When she recovers from a medically induced coma, the past five years of her life are lost from her memory. Leo is a stranger, and Paige is more comfortable with her parents (Sam Neill and Jessica Lange) and still in love with former boyfriend Jeremy (Scott Speedman). Paige and Leo gingerly try to re-establish their previous relationship, but while Leo is still madly in love, she is cool and detached, unable to find any passion in her work, and incapable of resisting the pull of her rich parents and Jeremy's re-ignited attentions. Leo does his best, but some clumsy missteps result in Paige moving back in with her parents, and the marriage teetering on the edge of extinction. There is nothing not to like in The Vow, with a story of a fervent match made in heaven and a devoted husband fighting to re-earn the love of his wife. McAdams and Tatum have reasonable chemistry, the familial conflicts are never over-exaggerated, and Chicago provides steady support. Even the best friend characters are relatively normal rather than excessively animated. The film may lack a hot spark, but in being reasonably faithful to the essence of a true story, it probably wasn't looking for one. Rachel McAdams is sweetness personified, her glowing personality carrying The Vow whether as the devoted wife or the confused victim of amnesia. The perkiness factor is never in doubt with McAdams, and the camera absolutely adores her, but doubts remain about the available depth behind the vivacious girl-next-door persona, and The Vow does little to challenge her. Channing Tatum is lumpy, with a performance that is far from convincing enough to confirm his credentials as a leading man. His portrayal of the sensitive husband struggling with a fractured life is full of doe-eyed sadness, but he never threatens to dominate the screen with emotion or anguish. Stalwarts Sam Neill and Jessica Lange provide straight-back support as Paige's parents, and Lange is afforded one dramatic scene to try and cook a stiff stand-by-your-man story. Neill never wavers from a stern Dad role straight out of the first chapter of the screenwriting handbook. Director Michael Sucsy, in his big-screen debut, rides with the flow, wisely relying on McAdams to smooth out the rougher patches, erring on the side of over-exposing Chicago's landmarks, and generally doing little to either get in the way or enhance the narrative. The Vow neither disappoints nor surprises, it just marches stoically down a well-worn aisle, delivering the requisite gentle tears and warm laughs.